Good news! Emma is back from her recovery after an operation on her wrist! She'll be joining us at tomorrow's Gloucester Folk Trail weekend to blow her horn and sing her heart out. We're still a bit light on gigs as Emma has only just had the go ahead to start playing again but hopefully we'll soon be coming to a venue near you! The weather is taking a brief respite from raining and the sun is shining.. summer must be here! For at least five minutes anyway! Bewelian-land is busy (yes - we've decided to move into a parallel universe where we can have our own country) and we've got some great new songs which we're in the process of arranging before getting to try them out at one of the fab gigs we've got coming up over the summer. Before I continue with that though may I give a shout out (that sounds rather a dated phrase now but I'm going to run with it) to everyone who came to see us at the recent Gloucester Shanty Festival! Steve Rule and the other organisers worked their fabulously talented rear ends off to create something wonderful for Gloucester and we we're all very proud to have been a part of it! Highlights from my fuzzy memory (and I wasn't even drinking!) include the landlord of the Long Dog Inn dancing on the bar (followed by a number of patrons), all five of us with accompanying instruments fitting into the Long Dog Inn ( we took up about 60% of the available space in this small pub!) and still finding room for everyone to dance and have a good time, and very randomly meeting a friend from school who I hadn't seen for at least 17 years!! And that was just the first gig - the Fountain Inn (or Bewelian's spiritual home as we like to think of it) were as lovely as ever to have us over on the Sunday and a cracking night ended with our customary conga line around the pub (although we got even further this time making it all the way around the fire place at the end of the pub - thanks to Ben & Sam!). The next couple of months see us in a village hall at Kempley for their folk club summer party, crossing the border to Wales to play at the epic Caerleon Festival near Newport, a wonderful homecoming gig at the inaugural Gloucester Folk Festival then heading to the trees (literally!) at the superlative Treefest at Westonbirt Arboretum (where Emma and I got married!). And we've got some new songs!! Yes - I've been busy arranging again and scouring the folk archives for traditional songs to beg, borrow and steal and we've got some cracking new numbers. This rousing and convivial song was penned by one William Alexander Barrett and published in 1891, has been on my 'must get around to' radar for some time. Like all good songs there's a belter of a chorus and Emma is particularly happy that there is a reference to booze in great quantities! And like many good folk songs the lyrics stray around like a drunk on their way home from an all night party. It starts off on topic by extolling the virtues of English beer and cider then kind of strays from the main topic to, basically, say how much his Wife nags him and his Dad downed somewhere in the sea but doesn't mind as there's booze in England... it'll all make sense one day. I've shied away from this one for quite a long time as it's been done by a lot of bands already (from Steeleye Span to the Levellers) but I've finally weakened and looked at an arrangement because a) it's a blimmin brilliant song, b) As Bewelian, we definitely have a voice of our own now and feel able to take on these songs with a touch of originality and our own "stamp", and c) why not huh? It's not quite ready yet as I've still got the sax and drums parts to finish off but hopefully can be unveiled for the Gloucester Folk Festival gig! We very much hope to catch up with you for at least one of the upcoming gigs - enjoy the summer! Happy new year to everyone everywhere! 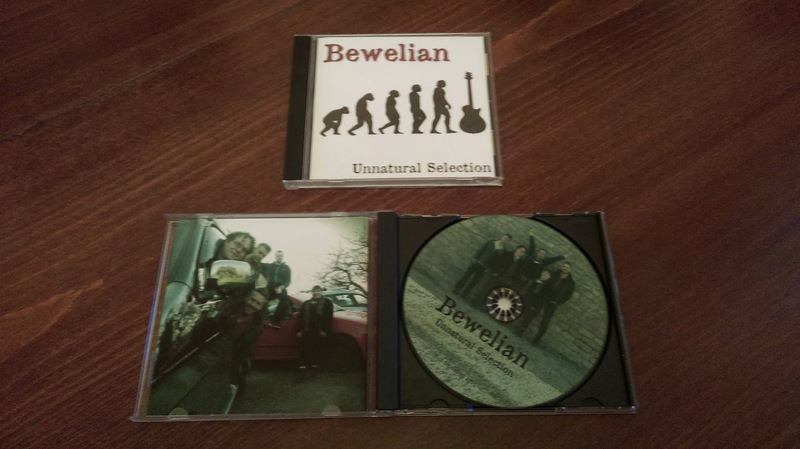 2015 has been a great start for us and we're really looking forward to more Bewelian madness in 2016! Our first gig of the year is on the 8th of January at the legendary Cafe Rene so come and join us to greet the new year! Well... we've all survived the summer...just! We've had a fantastic first run of gigs with Bewelian and we're very excited to be planning for the rest of this year and next year! We're busy contacting venues but more importantly we've been back in the rehearsal studio writing and arranging some new songs! We'll let everyone know when we have a gig nearby to unleash the new material - hope to see you soon! We've all had a fantastic time at the very first Gloucester Shanty Festival (and Dymock Festival) last weekend and survived (just) the entire weekend of eight gigs! Friday night in Cafe Rene was just about as bonkers as a gig gets (or so we thought until Sunday night at the Fountain Inn on Sunday night!) and was the very first Bewelian gig where we properly got people up dancing. It was also the first time that we'd played our arrangement of 'Drop of Nelsons Blood' (think of a Shanty merged with a reggae groove!) and that caused the audience to go even more loony - and we LOVED it! We were also lucky that weekend to play at Dymock Festival - possibly the most organised festival I've ever played at! They had a such a great setup and it was only a pity that we couldn't have stayed for longer but we had another gig to play at the Fountain Inn back in Gloucester. Ahhh... The Fountain Inn... Definitely our best gig to date - and it felt like we were playing in our front room rather than a pub. My abiding memory of the night was of friends dancing on the window ledge and leading a conga line in a very small space! So a wonderful weekend was had by all and our thanks go to the wonderful people who came from near and far to the gigs. But it was only made possible by our friends Debra Hannis and Steve Rule. Two fantastic people who believed in us and booked the band for the festival before they'd heard a note played! They are so wonderful that a room full of superlatives couldn't contain the thanks we owe and the joy they bought that weekend! Cheers! We'll be rehearsing some new songs in June (so long as I complete the arrangements!) and July is going to busy for us with gigs at the New Inn, Gloucester Quays food festival, Bearfest in Bransford (Worcestershire) and then back to the Fountain Inn playing our folky mix-up for Gloucester Blues Festival. It's been busy busy busy since releasing our album 'Unnatural Selection' in February! We've had really great feedback from people who have seen us at the gigs and even more from people who have heard the CD. We've not been resting between the gigs though and have been writing, arranging and rehearsing three new songs to release on the world at the Gloucester Shanty Festival at the end of May. Our friends Steve Rule and Debs Hannis are the organisers of the very first Gloucester Shanty Festival which is due to to coincide with the established Tall Ships festival at Gloucester Docks. They very very kindly put their trust in us and agreed to have us play before we'd even released the CD and we're very very fortunate to have three fantastic gigs at the festival. Pop along to https://www.facebook.com/gloucestershantyfestival for all the details on the festival. Please do go along and support the festival as it's fantastic to see the city of Gloucester blossom with these cultural events! On the same weekend though (it's going to be a very busy weekend!) we'll also be last act on the community stage at Dymock Festival (we've been told they had an audience of 1400 people last time) and we're massively excited to be able play there and bring some Bewelian joy! We're more excited than a very excited thing, which a very good reason to be excited, to announce that our album 'Unnatural Selection' is now available to download from iTunes and Google Play and will be available from Amazon mp3 in the next few days. Don't forget the CD is also available direct from us! Our album 'Unnatural Selection' has arrived - on sale from today for £5 available through the band (or get in contact via Facebook or Email)! Our debut EP 'Unnatural Selection' will be available from Monday on CD! We're also in the process of getting onto iTunes and possibly Amazon mp3...watch this space! I'm exhausted... I think we all are. But we're also all massively excited and proud of what we've done in the last two days of recording. First off a massive thanks is due to David Pickering of FFG studios who has, with never ending patience, led us through the process of going in with six songs and coming out two days later with a CD. Even when I asked if I could record yet another version of a guitar solo for the tenth time did he bat an eyelid! The man has the patience of a large number of saints combined! Without this hopefully sounding like a Sunday football match report I can reveal that we managed to get everything we wanted to record done - six songs - on the first day (which may not sound much but it really is when you think we've got to play each at least three times to get things sounding exactly as we wanted) leaving the second day for mixing and tweaks. We piled into David's studio at 9am on Saturday, set up (remarkable quickly I thought) and hit out the last notes of 'Miss Baileys ghost' (a supernatural tail of murder, haunting and bribery) by 10:15. By lunchtime we'd finished three more; Onboard a man o' war (about a sailor who rather wishes he hadn't press ganged into the navy), Cold haily windy night (about a rather naughty soldier doing bad things to a young maid then leaving!) and Rambling Sailor (about a sailor and lady of negotiable affection (as Terry Pratchett would write) with an twist to the ending) which meant all the electric guitar tracks were done. A spot of lunch and it was photo time... Not that I enjoy having my photo taken but these things are a necessary evil of making an album. Emma and I were wracking our brains (in the pub on Friday) for album names / ideas and, in some strange roundabout way, ended up looking at the pictorial version of evolution (you know, the one that starts with an ape at one end then show's our eventual evolution to homo sapiens)... and came up with 'Unnatural Selection'! 2) We're playing arrangements of music that was mostly collected over a hundred years ago so we're playing an evolution of our traditional music... Maybe a side branch but it's definitely still on the folk family tree. If it were a family tree we'd probably be the side that gets drunk at family weddings and stays up till 4am! So after that distraction we headed back in and recorded the last two tracks; A country farmers son (about, unsurprisingly, a country farmers son - who has his head screwed on right) and finally the strangest arrangement of a shanty heard this side of Bristol - Good morning ladies all (which has been transported, from Stan Hugills original collecting near the city of Mobile in a southern state of North America, to become a blues/folk song). The instrumental side finished we were left with doing the lyrics and a small number of over-dubs for solos. I can hereby confirm that singing after the music is down is a nerve wracking affair - mostly because you know that the band have put their all in already and you don't want to let everyone down! Think of being put on stage in a spotlight after you've just woken up and find yourself wearing a smoking jacket, waders and nothing else... And you might get an idea of the strangeness, panic and expectation of the moment. The general consensus is that we've done alright (phew!). Today (Sunday) has been about mixing, tweaks and laughter (it's great being in a band with friends who crack you up). We left by 5pm with the mixed CD in our hands and only the mastering, CD design and duplication to go. I'll say goodnight now as I'm falling asleep at the keyboard but we hope to see everyone who can make it at Mr Wolfs in Bristol on the 2nd of March for our first gig... And then you can buy the CD! So... After 24 hours of rehearsals (not done consecutively! We're not insomniacs!) the big day has arrived and we're off to the recording studio. The songs are all as practised as they can be and, even if I do say myself, sound pretty damn good! And now the real work begins! Please do get in touch any way you like! We may not be fully out there yet but we're always looking for places to contact to play at and friendly people to say hi to! First off - hello - my name is Martin and I am one half of the folk duo 'The Vogwells' and one fifth of the Bewelian. 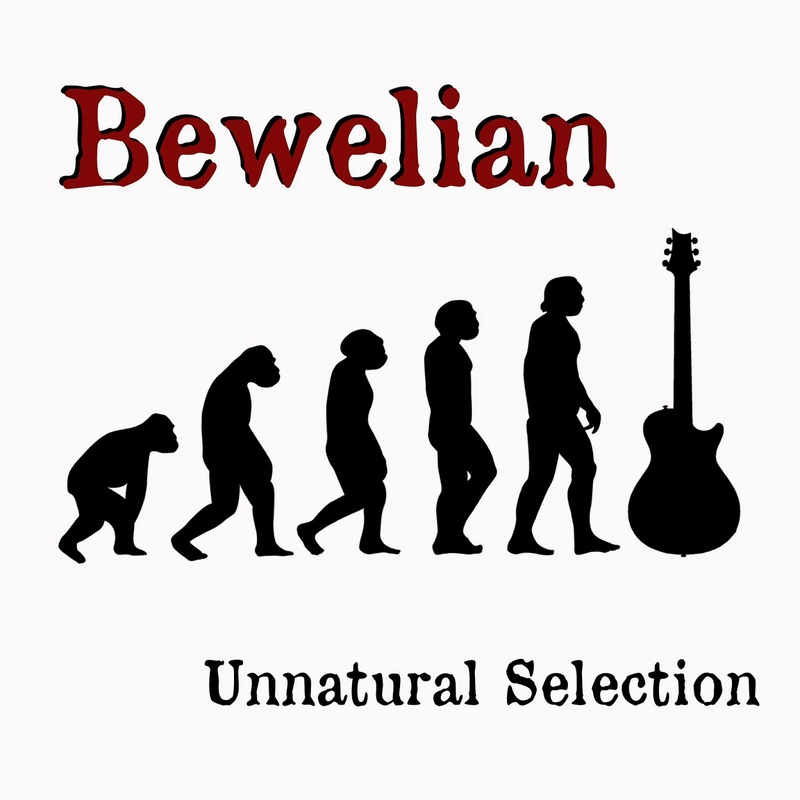 As the front page of our website says Bewelian started life in the pub. Myself and Emma (alto sax and vocals) are married and live next door to bass supremo Damon Coombs (of rock/metal band Nukchorris) and Sunday night often finds us, with Damon's better half Liz, down the local at the pub quiz. After too much cider and caramel bubble bar cake we talked about starting a band that took British folk songs and mixed them with the multiple influences we'd gathered over our musical careers. Damon and I started jamming and creating some basic arrangements. The important thing for us, especially for myself and Emma who are most involved with playing Folk music, is that we try to maintain the essence of the songs - the stories, rhythms and overall joy of passing on our native songs. Move forward to May 2014 and myself and Emma found ourselves playing the final gig with our excellent friends in Blues Brothers Reloaded. For nearly nine years we'd been playing the Blues Brothers songs around the country and the band was coming to an end at our other guitarists' wedding. On drums that night was one Alex McIntosh and I happened to mention that we were thinking of trying out something new involving British traditional music. After jamming through a song during sound check Alex showed an interest. As good drummers are like the Yetti this made me exceedingly happy - the band might finally happen! We also at that time contacted our very good friend and long time musical partner in crime Joe Griffiths to complete the line up. Myself and Emma have been playing in bands with Joe since I was 14 (many moons ago although I'm not admitting how many!) including our very own Jazz quartet (three + 1 for anyone who remembers a group of underage youths playing in pubs around Gloucestershire and beyond in 1995), a soul band and the aforementioned Blues Brothers Reloaded. Joe said yes and my smile got larger still. Once everyone was in I rather panicked. I'm in awe of my colleagues playing and now had to come up with full band arrangements to match their high abilities. A number of late nights ensued and on the 14th of July 2014 we had our first rehearsal and... It worked. My smile was of Cheshire cat proportions. As with any band we've been through a million names including 'Old Greg', 'Strange Vicious Peasants' and 'Alberts Trousers' but have finally come to rest of the name Bewelian. It means 'to mix up' in Old English and neatly sums up what we're trying to do. We've continued to rehearse ready for release in 2015 (with a small break in October and November for important family time). c) record an E.P. in January then start gigging after that! Simples. We've already been booked by the wonderful people at Gloucester's very first shanty festival and will be pestering all and sundry for gigs very soon! Keep 'yer eyes on this space!